This month Sowmya of Nivedhanam challenged the Northern Group of SNC to cook Venthayakeerai Paruppu Urundai Mor Kuzhambu(VPUMZ). 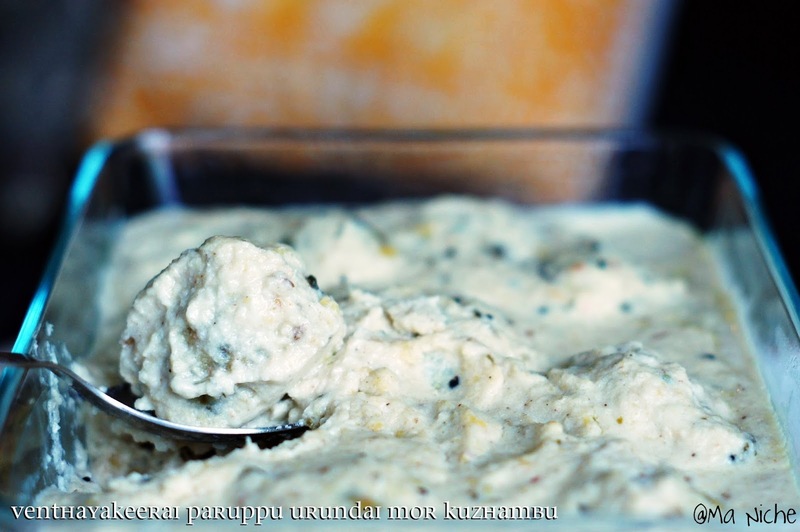 Since I do not know Tamil, before plunging into the recipe, I googled to find out what VPUMZ meant. And this is what i gathered. Venthayakeerai translates to fenugreek leaves, Paruppu to lentil or dal, Urundai to balls, Mor to buttermilk and Kuzhambu to curry, in English. 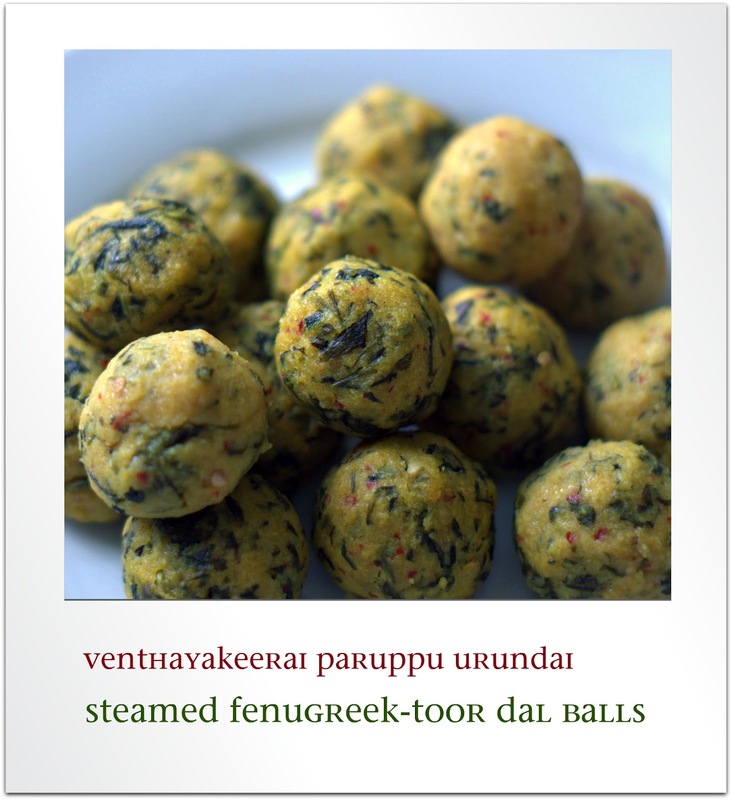 So the dish we were challenged to make was in fact Fenugreek leaf-lentil balls in Buttermilk Curry. It was a fairly simple dish to cook. in spirit, it felt like a south Indian version of Palak Kofta Kadhi. while besan is used to add flavors and thicken the gravy in Kadhi, a coconut-lentil paste is used to thicken the gravy in Mor Kuzhambu. 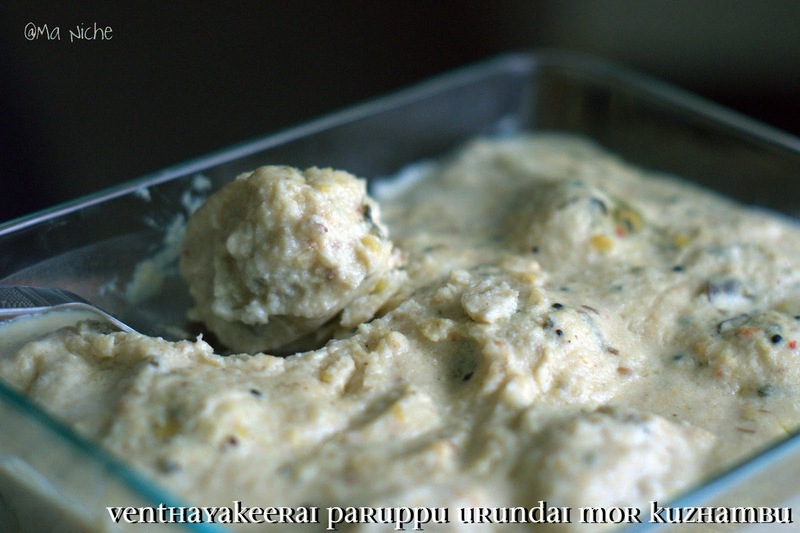 the other point where VPUMK differed from Palak Kofta Kadhi was that unlike the Palak koftas which are deep-fried, the Venthaya keerai Paruppu Urandai's are steam cooked thereby making them a healthier and easier-to-cook alternative. so over all, i have only praises to sing for this south Indian version of Kadhi and i thank Sowmya immensely for having introduced it to me. i soaked the toor dal and chana dal in warm water for 1 hour. then along with the green chillies, grated coconut and cumin seeds i ground the dals to smooth paste and added the paste to the beaten curd, seasoned it with salt and kept it aside. i soaked the toor dal in warm water for 1 hour. then along with the red chillies i ground the dal without adding any water. the idea was to make a coarse paste. however since the ground paste did not look coarse enough i added some semolina to the paste*; then added the fenugreek leaves, asafetida, turmeric and salt to the paste and made 1 inch diameter-ed balls out of the paste. with the quantity of paste I had, i ended up making 15 small balls. once done, i removed the balls from the steamer and kept them aside. after the Mor Kuzhambu had rested for about 15 minutes, i heated it and brought it to a simmer. i then added the fenugreek-lentil balls or Urandai to the Kuzhambu, added some water to the saucepan and cooked the balls in the kuzhambu until the balls floated up on top. finally i heated the oil for tempering, added asafetida and mustard seeds to it. once the mustard seeds started spluttering, i added the red chillies and curry leaves to it and soon after added the tempered oil to the Paruppu Urandai Mor Kuzhambu. and thats it. the curry was ready ! * this was not part of the original recipe. skip the semolina if you can make a coarse dal paste. We had it with rice and zucchini-posto for dinner tonight and we enjoyed the combination a lot. Thanks to Sowmya for the challenge and a big thanks to Divya for starting the South Vs North Challenge. Just beautiful! Thank you so much for sharing with Full Plate Thursday and have a great week!